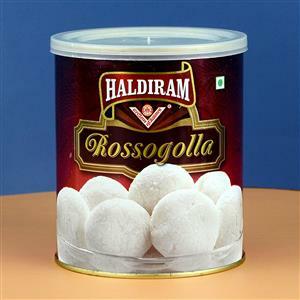 Send Haldiram Rasgulla (Express Delivery) to Chennai. Gifts to Chennai. Send Sweets to Chennai. Description : This tin consists of 14 pieces of delicious, soft, spongy Rasgullas made of milk, sugar, and rose water. Weighing a kilo, this tin has a shelf life of 12 months, if unopened. The Haldiram sweet pack is hygienically processed. Send these sweets to Chennai through Gift2Chennai.com. You can also send other Gifts to Chennai. Please Note :- The picture is indicative.